The writings of Raymond Carver resonate with me. He captures living as an act of departure from a time and a place when we once knew ourselves. When my parents divorced, my father moved back out to California and my mother moved me back down to Manhattan. While my father drove a convertible, got stoned, and went to open air concerts, my mother delved deeper into fashion, painting, and a cosmopolitan cult called The Work. I was flown regularly back and forth between the grit of The City and the shine of Southern Cali, between the earnest searching intellectualism of the East Coast and the sunny disposition of the West, between a maternal preoccupation with self-improvement and a paternal conviction that everything turns out right in the end. My mother would rise at 4am to meditate and was giving all her money to other people’s causes while my father inhaled cocaine and advised other people on how to invest what they had. I was a bicoastal urban kid of divorce with parents who were ethically opposed to adulthood as it had been defined for them. Turning thirty was a crisis. Now that I am grown and in regular dialog with many of my own former selves, I understand how hard it is to identify a clear boundary line for adulthood. I carry all those selves with me. One of the most pressing is the ten year old girl who stayed up late November 4, 1980 to watch Jimmy Carter lose the election. The suits won. Childhood lost. The grown-ups got it wrong. One of my guiding impulses is to mark a history, to excavate a thing buried within itself and obscured by the naming process or the passage of time. I work with what I have. The sliver, the slice, the glimpse, the periphery. I try to capture the whole through its parts. What is the larger narrative, and at what point does it become discernible? Small mysteries mirror a larger state of not knowing. Don’t look. The space between words isolates them. Don’t look. The “look” leaves the "don't" behind. The look is present; the don't is past.The look forgets the don’t. Don't look. There is only: look. Of the frescoes in the cloisters of San Marco, William Hood writes that there is no attempt to “integrate the past with the present.” The Mocking of Christ is remarkable in this regard. Intentionally disembodied hands and heads orbit the figure of Christ. The floating head spits at Christ’s blindfolded and seated figure. Here, not even the present integrates with the present. The divine eternal eclipses it. The not-Christ is peripheral and partial. I had assumed that the missing fragments of torso and limbs had been lost to time and that the visual information had been irretrievable to contemporary restorers. In fact, Fra Angelico omitted the material from the beginning. Nothing had been “lost to time”. I stopped my mourning. Still, The Mocking of Christ presents a death of sorts. The death of beginning, middle, and end. The death of narrative. 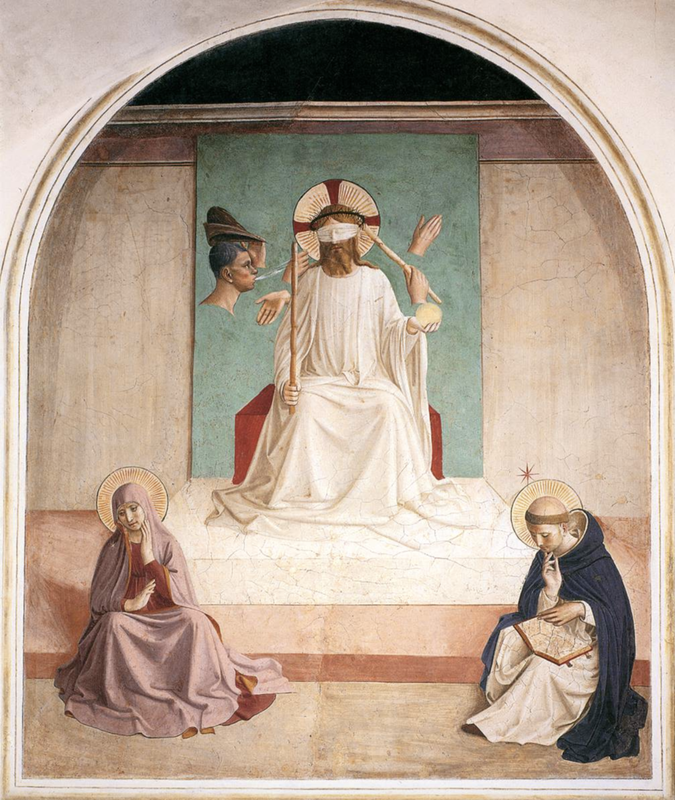 Fra Angelico may have been the first Modernist. God in the figure of Christ (here seated in a royal pose with orb and staff, not humbled on the cross) is situated as the great Immediate. There is only the great: I am. Summer 2016, I attended a ten day residency at Gullkistan Center for Creativity in Iceland with my Canadian friend, the curator Melanie O’Brian. 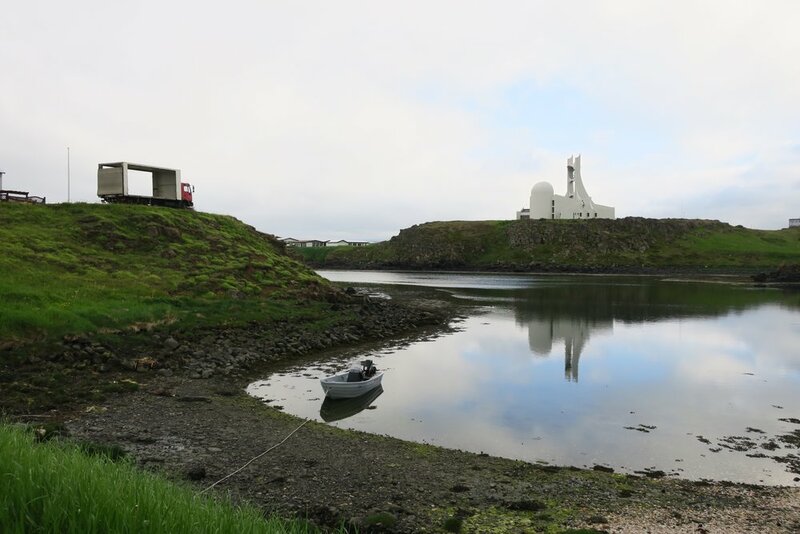 Our “Aim of Stay”, as they phrase it at Gullkistan, was to engage the tradition of walking thinkers by conducting a series of conversations about art and its many tangents while walking the Icelandic landscape. We were sitting in a hot pot after a day’s walking when Melanie mentioned a friend of hers who was researching the last living speaker of a dying language. I had always understood the tragedy of a lost language as the death of an audible experience, but Melanie phrased it as the loss of “a perspective, of a way of seeing the world. “ She said, “A word is a way of seeing.” Later, we talked about my endeavor to establish an arts incubator at my university. We talked about arts entrepreneurship. We talked about entrepreneurship as a discipline heavily imprinted by the language of business, and Melanie cautioned me to not surrender the language of art. Back in the States, speaking into a recorder while driving from Kentucky to Alabama, I thought of surrendering the language of art to entrepreneurship, of losing the word, the way of seeing that the arts carry that is reflected in the language that the arts deploy. There had been no internet in the summer house where Melanie and I had stayed and so, in bed at night with the midnight sun as my lamp, I would compile daily lists of words that captured the day’s key insights. One word was “generativeness”. The note app on my phone autocorrected it to “generative mess”. Art is a generative mess. It unknows to know better. In the spirit of not surrendering the language, I named the arts incubator the “generator”. When I was six, and wanted to be a ballerina and a part-time veterinarian, ballerinas and veterinarians told me not to be either. Never talk to actors about acting; they’ll tell you there’s no work. Or lawyers about the law; they’ll tell you they wish they were park rangers. People in any field rarely encourage you to join them. No one ever tells you to go into art. People with job-jobs often think art school is a fraud, especially if they are the parents of an undergraduate majoring in art. According to a reading of the 2012 US Census by the artists collective bfamfaphd, only 10.1% percent of art school graduates become "working artists". 16.8% become educators – presumably to turn out the future 10.1% percent success rate. 14% are not in the labor force at all, having married well. 23.1% quit art for something not-art; 17.1% are in sales. (Some other time, we should investigate this difference between "not-art" and sales.) Alexis Clements published these statistics on Hyperallergic.com under the header, “Indicting Higher Education in the Arts and Beyond”. To buy into the indictment, you have to concede that the sole purpose of a degree in art is the making of art. If by “the profession” we mean painters painting, sculptors sculpting, or printmakers printing, then ten percent sounds right. Not everyone is cut out for the priesthood. Art has always attracted more people than are capable of withstanding its rigors. There is an allure to the image of the artist, but this image obscures the demands of the discipline. The writer Truman Capote said, “I can't think unless I'm lying down, either in bed or stretched on a couch and with a cigarette and coffee handy. I've got to be puffing and sipping. As the afternoon wears on, I shift from coffee to mint tea to sherry to martinis.” No mention of writing in this portrait of the writer-at-work. Capote was indeed an alcoholic who liked to lie down, but that was not the whole of it. His statement was stylized and is but one of many contributions by artists to the myth that creative process defies definition. People loved Capote for it. Back then, they celebrated the mystique. These days, not so much. In its census analysis, bfamfaphd.com identifies 23.1% of Art school graduates as employed in "Other Professions" and then lists CEOs in the category. What purpose does training in Art serve? What are its professions? The question is not, "What does an art degree get you?" The question is, "What does an art degree indicate?" Job statistics mask Art's broad application. In addition to craft, art school teaches a process, one recognized as the basis for innovation. The discipline of Art teaches students to experiment, to prototype, to quickly incorporate lessons derived from failure, to operate transparently in presenting work or providing feedback, to collaborate, and to share findings with the public. You get all that in Painting 101. With Love and Squalor: A Letter to Artist Friends Shortly After the Birth of Their First Child, Esme. What an incredible month you have had. I am at my kitchen table; syllabus prepping, listening to my household begin to stir (dogs, the kid, my mom). I am thinking of you in the midst of the managed chaos that has become my life. For instance, I thought I could get some work done (you know, live and let live), but as I email you I must simultaneously look up the name of the center outfielder for the Pirates and whether or not David Ortiz plays for Boston. The kid likes to process his thoughts out loud (he takes after me in this way), so each baseball card is announced as he flips through the pile. He's got Bryce Harper. Just now: "Mama, look. Can you see? See? See? Get it? Kershaw and Cueto. Kershaw and Cueto. Same guys, different cards." I love this kid. I imagine myself at 44 without having had this kid and it is the loneliest feeling. The kind of lonely you can't fix. The kind where you wonder if you should have had a kid, if that's what missing. Everything else is more complicated because of this kid. Some days, he takes my last ounce. Actually, my love for him takes my last ounce because I would not take some of the crap he doles out from anyone else. (Didn't know tight socks were the end of the world. Didn't know tight socks make me the worst parent ever. Spending $1,000 on the opportunity that is soccer does not make up for tight socks.) And at least once a day, I get ugly. Do NOT f-cking talk to me that way. I am SORRY I swore. The kid takes our last ounce some days because the rest of the world wants our last ounce, too, and we are going to give it to the kid first. So glad Esme is here to take your last ounce some days. So happy for you. "Mama, Ivan Nova is a pitcher for the Yankees. Can you look up this picture online?" "The same picture right here on the card?" "No, kid, I can't, there must be a ton of images of him online." (Though I am already typing in "Ivan Nova".) "There it is, that's it." Neil does an impersonation of the kid calling me from the other room: Mama. Mama! Ma!Ma! maMA! maMA! "maMa!" means "You and I are one person. You are an extension of me. I am looking for my stupid motherf-cking socks and. . .maMA!" Have the best time ever with every little detail, joyful or tortuous.